If you can’t wait for her performance, Listen Here for a preview. 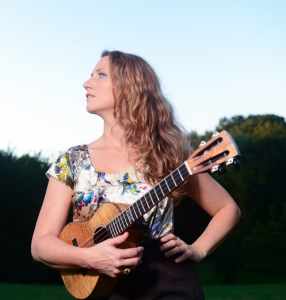 Award-winning songwriter and performer Victoria Vox returns to the One World Coffeehouse to celebrate the release of her latest album, Colorful Heart. Her trusty ukulele and own mouth-trumpet accompany her pure voice for a memorable evening. Once a resident of Baltimore, she has hit the big time, opening for Jackson Browne, Tom Chapin, Leo Kottke, and Cheryl Wheeler. Don’t miss her when she comes through town! Feel free to bring a dinner basket & BYOB. Baked goods & non-alcoholic beverages available for a small donation. ALL proceeds (after paying the artist) benefit those in need through the charitable outreach of the Unitarian Universalist Congregation of Columbia (UUCC). The One World Coffeehouse started in 1999 with the goal to build a sense of community by presenting an diverse array of artistic and musical talent in a comfortable, family-friendly setting. Evening performances happen most 3rd Saturdays in a grand listening room with candle-lit tables. A unique feature of this venue is a separate listening/viewing room where parents can tend to active little ones while still enjoying the concert. Visit the main Coffeehouse page for details about our upcoming concert. Can’t wait to hear Victoria again!! !